This has triggered some speculation about what this Identifier actually consists of, what effect it has on the file, and a few other questions. Obviously, we’d be crazy to reveal exactly how it works, but we wanted to shed some light on the overall method we use, and in particular to allay a few concerns about what this might mean for those of you who have bought genuine Celestion impulse responses. What does Authestion Marked mean? Authestion is the name we’ve given to our audio file protection technology. Put simply, when a customer places an order for a particular Celestion IR download, Authestion adds a unique Identifier within the waveform of the file (the audio data itself), making the file unique and therefore traceable. Each impulse response you download from CelestionPlus.com is Authestion Marked. This Identifier can then be read later, by running the file through a decryption script. 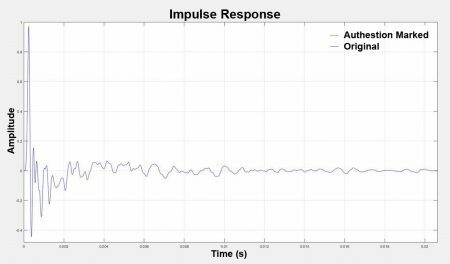 This allows us to determine when and who purchased this particular impulse response file. Is Authestion a new technology? Digitally marking audio files is not a new process, but most marking is carried out for music files, to prevent unauthorised sharing or reselling of commercial music recordings. Impulse response download files have different characteristics to normal music files, so we developed Authestion to take those differences into account. Of course, we looked at current methods as a starting point. But what we’ve developed is, we believe, an order of magnitude improved over previous digital marking of audio files. Does the tagging stop me doing anything with my IRs? For example, does it stop me copying them onto multiple amp simulators or DAWs that I own? Or could I ever be locked out of using the files? No, no and no. Authestion Marking doesn’t prevent you from doing anything in terms of loading them up and using them to make music. So you can install them on multiple pieces of kit, make personal backups and so on, no problem. And the marking doesn’t prevent you accessing the files in any way. What it allows us to do is check any Celestion IRs that we find being shared online – in forums or elsewhere. We can run the file through the Authestion software, retrieve the Identifier and find out who that file belongs to – and where required take appropriate action. 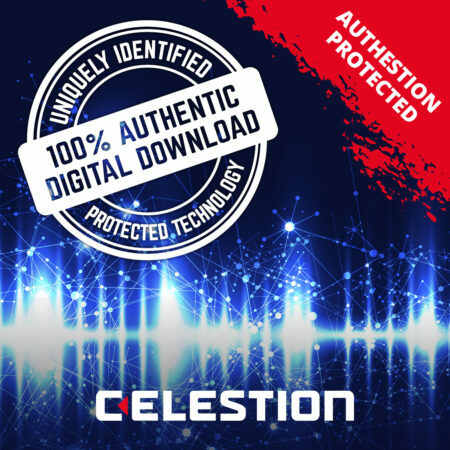 We feel that’s not only fair to us, given the expertise and investment we’ve put into creating a pro quality product, but it’s also fair to our valued customers who have paid to download authentic Celestion IRs. Does the Identifier contain any personal information that someone could potentially see? No. It doesn’t contain any personal data – just a unique tag that was generated when the order was placed. Because Authestion is our very own system, no-one other than Celestion can extract the data in the Identifier. Even if someone else did manage to extract it (unlikely!) the Identifier is meaningless except to us. 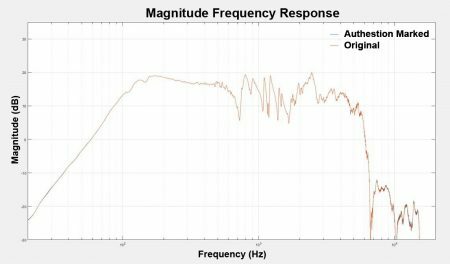 How does Authestion Marking affect the sound quality of the IR? One of the particular requirements we had in mind when we developed Authestion, is that it must have an unnoticeable effect on the way the IR itself works. In other words, we needed the marking to be ‘audibly invisible’. Faithfully captured Celestion speaker tones are what our customers are paying for, after all! To show just how ‘invisible’ an Authestion Marking actually is, here are two graphs which show comparisons between marked and un-marked Impulse Responses. Struggling to see any difference? Yes – us too. If you look really carefully at the Frequency Response graph, you can just about see some blue in the high frequencies. At Celestion, as you might expect, many of us have worked in the quality audio industry for many decades, so our engineers know exactly what to listen for when comparing audio samples. The closest we had to someone being able to hear a difference was with one of the earlier (not as well developed) versions of Authestion – one of our younger engineers saying “I thought I could perceive something, but it was very subtle”. With the final version we are happy to refer to the marking as audibly invisible. View our complete range of Authestion Marked speaker impulse responses here, including our most recent additions to the IR range, the G12H-150 Redback, the Neo Creamback and the A-Type.